Profiling focuses on a variety of factors, but body language is central. Between 60% and 80% of communication is non verbal. When an individual lies, the body tends to give away clues that the person intends to deceive – for instance, raising the pitch of the voice, looking away from the person one is talking to, or flying into a tirade when questioned. Sometimes, tells may be normal responses, particularly in an airport. Although many emotional responses are not absolute evidence of deception, they are worthy of additional attention while the person conducting the profile seeks more information to make a threat assessment. Although we may communicate primarily with our voices, our bodies can project many different messages. Deception clues may be in the form of a micro facial expression, swallowing a change in breathing patterns, sweating, body and leg positioning, a slip of the tongue or a voice inflection. Why can’t liars prevent these behavioural betrayals? Sometimes they do. Some lies are performed beautifully; nothing in what the liar says or does betrays a lie. Liars do not always anticipate when they will need to lie, so there is no time to prepare a response and its delivery. Even when there has been time, someone may not be clever enough to anticipate all the questions that may be asked. This is why good security questioning often involves a series of questions, some of them seemingly unrelated to security. The second reason liars cannot always prevent body language from revealing deception is because of the difficulty in concealing or falsely portraying emotion. When liars choose to lie, they generally prefer to conceal rather than falsify. Concealment is passive, not active. This is because when a lie is told, it forces the liar to remember every single strand of the lie in order to ensure their story stands up. The 2 main indicators from which leakage will come out are the Hands and Face as it is hard to control each one and especially both at the same time. When a young child lies they will often cover their mouth with their hands to stop the lies making their way out. This behaviour remains present in adults, although it becomes much more delicate and less visible. 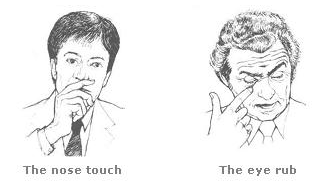 Although very similar, these physiological signs should not be mistaken for mental stress indicators such as finger tapping, voice shivers, cracking joints and nervous giggles. However, it is always important to remember that; “Not everyone who is stressed is a liar but every liar is under stress”. When involved in criminal or terrorists activities, people will often behave in suspicious and abnormal ways. There are many examples of suspicious behaviour with one of the most famous being associated with the events of 9/11. The terrorists arrived to check in only 30 minutes before departure. Given that check in time is usually between 1 and 2 hours before boarding, this can be seen as suspicious. This show signs of uncertainty and nervousness on the terrorists’ part. Perhaps they were having second thoughts. Omari never responded verbally to questions asked by Touhey; he just shook his head. In order not to show off their nervousness, liars can often be evasive. They may also have a forged passport from a country they cannot speak the language of. Atta was looking at Touhey with anger and impatience. Anyone with something to hide will want to get any checks made on them done as quickly as possible. Both terrorists carried a full fare business class ticket. The terrorists’ dress, appearance and behaviour were completely different to the profile of a normal business class traveller. The tickets for both terrorists were one way. One way tickets are very rare in airline travel. Why are not returning to this destination? Documents are a very good starting point in detecting suspicion indicators. Passport (including Diplomatic passports) from a terrorist sponsoring country. Passport is determined to have been forged or altered or to be otherwise invalid. Personal identification information in passport does not match passenger and/ or name on ticket. Passenger presents multiple passports or travel documents which contain conflicting data. Stamps or visas, less than one year old from a terrorist sponsoring country. Passport from a country other than that of embarkation/ disembarkation. Listed country in travel itinerary. Unusual or circuitous routing of ticket. Ticket purchased in manner unusual for place of issue. Ticket purchased or changed within 24 hours of scheduled flight. Ticket purchased in country other than that of embarkation or passport nationality. Baggage and/or contents of baggage are inconsistent with the passenger’s appearance, profession, ticket class or their description of the contents. Passenger claims not to have the baggage keys or does not know how to open it. Name on baggage does not match name on ticket or passport. Amount of baggage unusual for ticketed itinerary.